a Moldavian born, Romanian mathematician, computer scientist and creator of the first Romanian chess program. 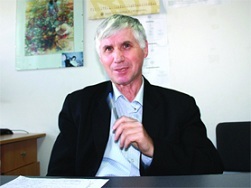 He graduated from the Faculty of Mathematics, Alexandru Ioan Cuza University, Iași in 1973. Later in the 70s, while affiliated with the Computer Institute of Bucharest, he worked on Astro 64, a chess program for the Felix C-256 mainframe computer, and programs for 8080 based microprocessor systems, i.e. the CUB-Z, and the small dedicated units, Labirint 64, which competed at the WMCCC 1983 in Budapest, and Atom 64. Viorel Darie is still active in chess programming, and author of the PC program Friendly Chess . This page was last edited on 9 April 2019, at 14:48.